The John Deere Rate Controller 2000 is compatible with John Deere Section Control to minimize overlaps, reduce input costs, and decrease operator fatigue. With John Deere Section Control enabled, the GreenStar™ 3 (GS3) 2630 and CommandCenter 4600™ displays will automatically shut off the product metering systems when the machine travels into an area that has previously been applied or defined by interior/exterior boundaries. The John Deere Rate Controller 2000 supports the documentation of up to four product applications on the GS3 2630 Display and can also be configured to run map-based prescriptions for variable rate applications. The John Deere Rate Controller 2000 is able to run a separate prescription for each of the product applications simultaneously. John Deere Rate Controller 2000 offers an integrated on-screen switch box making manual control of sections easy and quick. John Deere Section Control turns on and off implement or sprayer boom sections based on global positioning system (GPS) and field coverage, in an effort to reduce overlap in headland areas and oddly shaped fields. The John Deere Rate Controller 2000 is a drop in replacement for GreenStar™ (GS) Rate Controller equipped implements using the GreenStar 3 2630 Display. As a drop in replacement, it utilizes existing extension and product harnessing plus an adapter cable available in the attachments Price Page. 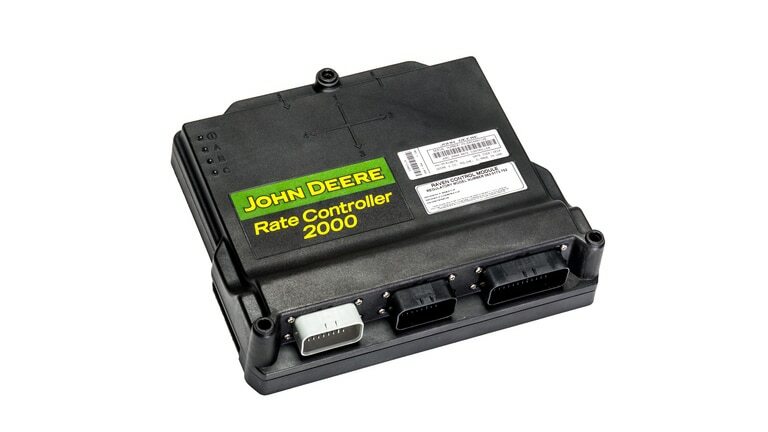 The John Deere Rate Controller 2000 is compatible with competitive multi-tank air carts. The John Deere Rate Controller 2000 can be configured as an air cart implement type and eliminates the need for a third-party controller. 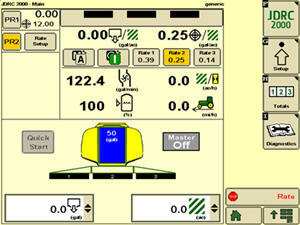 John Deere Rate Controller 2000 is capable of controlling up to five tanks/products and rpm fans. Rpm fan control will claim a product due to having its own PWM control. 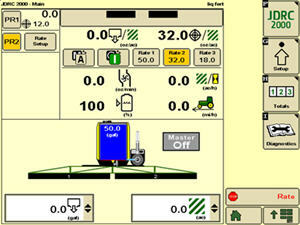 The GS3 2630 Display then serves as the operator interface that controls all product application with the air cart. 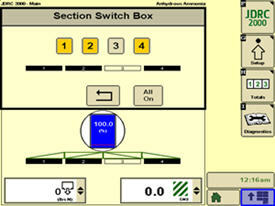 The John Deere Rate Controller 2000 can also do Section Control on dry product application equipment. For example, JDRC 2000, growers have the ability to assign dry products with multiple sections up to a total of 16. These 16 sections can be divided up between the active products being applied. 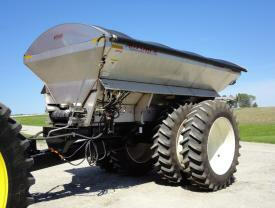 For example, if a grower is applying two products PR1 has eight sections and PR2 has eight sections for a total of 16. 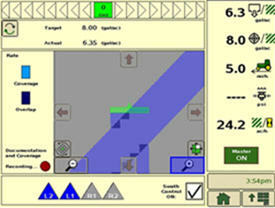 With the GreenStar™ Rate Controller Dry growers only have the ability to control a single section. 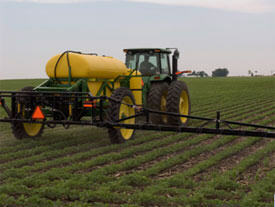 Some pull-type sprayers have a dual-boom or tiered-boom design in order to allow a wider range of speed and application rates. Flow-based control allows more efficient applications during spraying operations, especially when a second boom is incorporated on the machine. 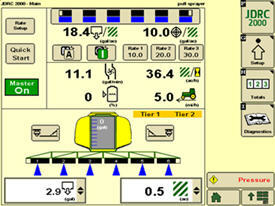 The John Deere Rate Controller 2000 is able to control these systems. 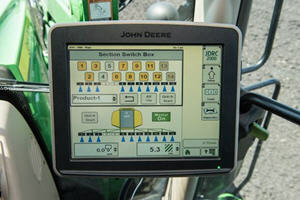 John Deere Rate Controller 2000 is compatible with many different direct injection systems. Depending on the injection pump provider, the user interface could be slightly different. When using a Raven direct injection system the John Deere Rate Controller 2000 is only compatible with the Sidekick ICD pump. ICD allows for better integration into the JDRC 2000 run pages enabling rate changes and product enable/disable with ease. Up to four direct injection pumps can be run at one time by the JDRC 2000. John Deere Rate Controller 2000 is also compatible with other direct injection systems as well. For example, when using a Surefire™ system, the JDRC 2000 will be set up as a multiple product system and the direct injection pumps will all be setup as additional products. 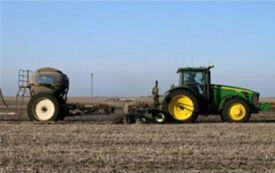 When utilizing other direct injection systems, the rate will be displayed in gallons/acre as seen in the above image.